You’ve heard of the Red Caviar from the Salmon, Black Caviar from the Sturgeon fish, and the rarest of all, the Gold Caviar from the Albino Beluga. Now, I’m going to introduce you to something even better, the Philippine Caviar – Fish Balls! Ok, so it’s not really caviar, but it has been proven time and again that these special fish ball treats are just as awesome, but nowhere near as expensive, as those other fish thingys. 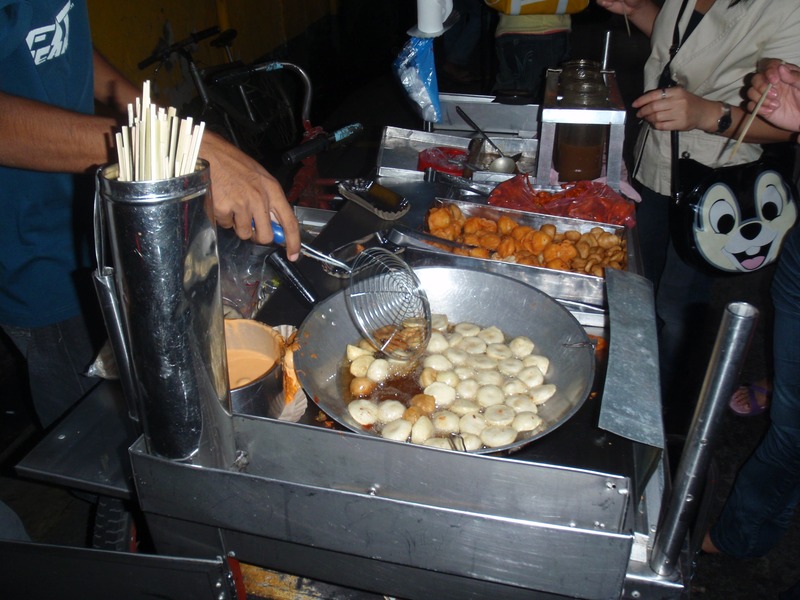 Simply put, the common fish ball in the Philippines, which can also be spelled fishball, is an edible, ball-shaped patty made of pulverized fish. It is somewhat flat in shape and most often made from the meat of cuttlefish or pollock and served with a sweet and spicy sauce or with a thick black sweet and sour sauce. These fish meatballs are primarily white or yellow in color, and measure about an inch to two inches in diameter. – Sweet/Sour (amber or deeper orange colored) – the sweet variety with lots of small hot chilis added. Dark sauces are rare as these are soy sauce based and soy sauce is expensive in terms of food cost for street food. 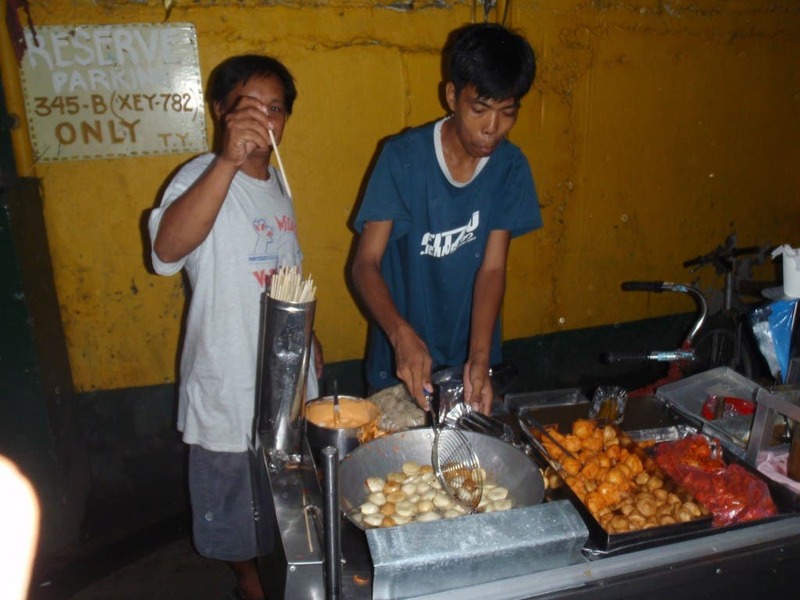 A recent trend in the Philippine fishball industry is the introduction of ‘ball’ varieties: chicken, squid (cuttlefish actually), and kikiam (pronounced que-kiam, a pork and vegetable mix). Chicken balls, squid balls and kikiam sell at about 2 Philippine Pesos (4 US Cents). Regular fishballs sell at 50 Centavos (1 US Cent). I first discovered this tasty street delicacy in my youth. Those crazy days when I was really young and living in the Philippines. My parents sent me to this conservative Chinese catholic school which was pretty much a a waste of my existence… lol (whole different story). Fortunately, the only good thing that came out of that was the discovery of after school treats of street food outside the campus. “Mang Alex” was a staple of life at that Nazi… I mean… Catholic school. The word “Mang” is pretty much like a “Sir” or “Mr.” title in the Philippines, and his name was Alex. But today, he is known as the LEGEND! He has the legendary recipe for the BEST Fish Ball Sauces that man could only dream of. It’s so addictive that once you try this, you would probably crave for more throughout your lifetime. I’ve tried street food, and other fish balls in particular from many different street vendors, and none of them even come close to this! And yes, you do have to try all the other varieties of street food such as the Chicken Balls, Squid Balls, Kikiam, Pugo (quail eggs), Day-Olds (one day old chick) and more. However, if you are one of the brave souls willing to venture into this fantastic journey, I recommend coming to St. Jude Catholic School, right next to Malacanyang (White House of the Philippines) and finding Mang Alex and his cart outside the gates of the school. He is usually there from Mondays through Thursdays from around 9am – 5pm or until he runs out of fishballs. For an even better experience, come here on a Thursday. St. Jude is said to be the saint for the hopeless and it’s also said that Thrusday is St Jude’s day, thus, every Thursday you’ll find masses, crowds, street vendors and lots of “hopeless” people praying for salvation at this Church. I remember being one of those “hopeless” people praying with a lit candle wishing to pass my next Chinese exam. I found out the hard way that hoping to pass a test, instead of just studying for it, is not the best strategy you can come up with. 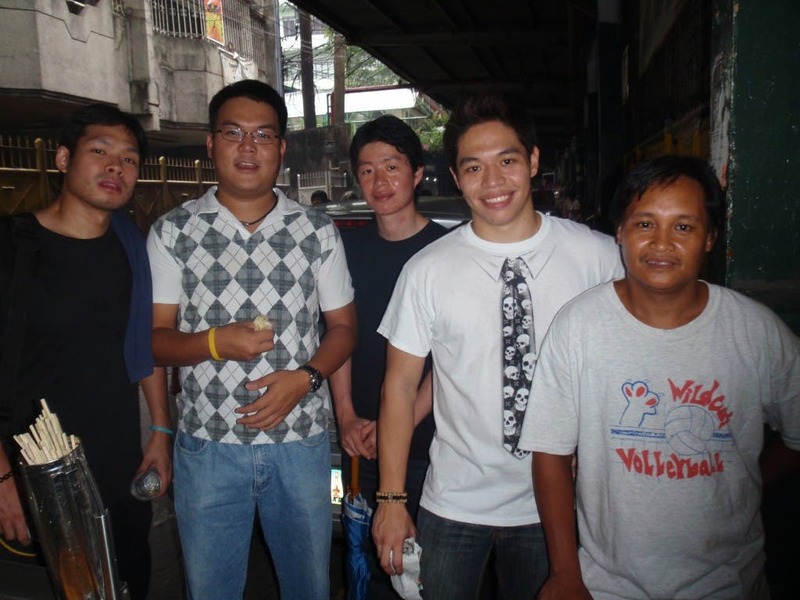 Next time, When In Manila, come to Saint Jude Catholic School and look for Mang Alex to try out his infamous Fish Balls and other street food. Try all his different street delicacies as well as the different specialty sauces he made. Be warned though that it will surely have you craving for more! P.S. Mang Alex caters!!! Seriously, you can rent him out for a day while he serves you endless street food at your wedding, party, event or whatever. He’s told us stories of him at fancy hotels with his street cart serving these fish balls to the even fancier guests. We’ve actually availed of his services and had him at our Christmas party last year. It’ll only cost you about P3,500 (about $80 US Dollars) for his services for an entire night. And yes, he will push his street cart to wherever you are. He’s a cool guy! P.P.S. Mang Alex was rated the #10 Best Streetfood according to CNN’s Best Streetfood in Manila list!